Founder and publisher of Southern Saltwater Fly Fishing Magazine Don Kirk was enshrined in the Legends of the Fly Hall of Fame in a special event at the Atlanta Fly Fishing Show the first weekend of February. Prior to starting SSFF, Kirk was recognized as an expert on trout fishing in the Smoky Mountain region of the southeastern states, and also founded Southern Trout Magazine. Southern Saltwater Fly Fishing Magazine Publisher Don Kirk (center) with the other members of the Legends of the Fly Hall of Fame class of 2019. 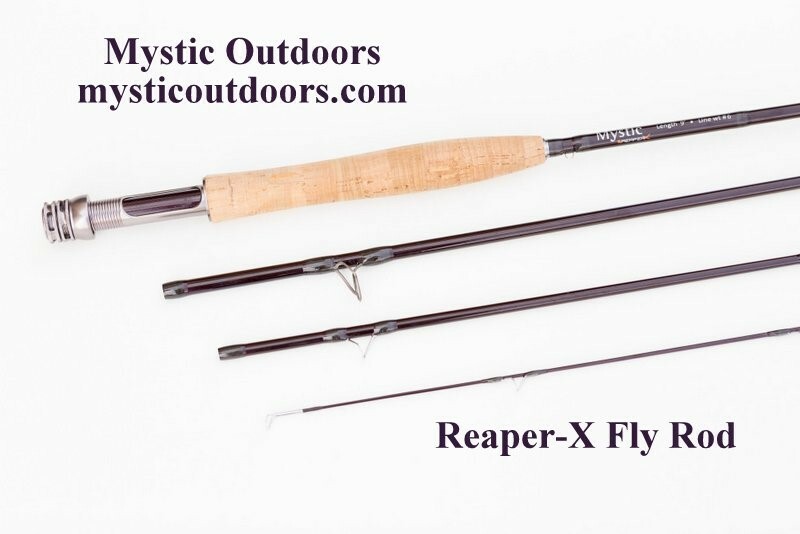 Anglers dropping by Southern Saltwater Fly Fishing / Southern Trout booth at the Atlanta Fly Fishing Show got to enter a free drawing for a Mystic Outdoors Reaper-X Fly Rod in their choice of any size. The drawing took place at the end of the show and the winner was Bill Beckwith of Fayetteville, Georgia. Bill chose the Reaper-X in a 5-weight model. SweetWater Brewing Company’s Jake Basnett recently joined the staff of the Bonefish & Tarpon Trust for a baby tarpon tagging venture. The group spent a day seine-netting fish that averaged 12 inches to be fitted with Passive Integrated Transponder tags. The tagging completed a four-year tarpon nursery habitat project by BTT in an abandoned residential development in southwest Florida. Tagging a baby tarpon at Coral Creek Preserve. The Coral Creek Preserve is made up of six canals feeding into a main canal that has an inlet on Coral Creek. The PIT tags and antenna arrays for tracking the baby tarpon are provided by SweetWater Brewing and other sponsors. SweetWater’s Goin’ Coastal tarpon cans. Thanks to the support of SweetWater’s #fishforafish campaign, BTT has been able to tag a juvenile tarpon for every photo of SweetWater’s stacked Goin’Coastal series of tarpon cans tagged on social media. Along with Duke Energy and Florida Fish and Wildlife Conservation Commission, Coastal Conservation Association Florida began releasing more than 16,000 juvenile and adult redfish in southwest Florida counties this month. The program was announced in the fall of 2018, and includes the donation of the hatchery-reared redfish from the Duke Energy Mariculture Center in Crystal River, Florida. Each of the releases include approximately 2,000 juvenile fish and 25 to 30 adult redfish per county, all hatchery-reared at the Duke Energy Mariculture Center. 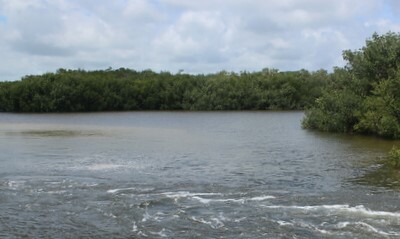 Releases have already occurred in Pasco County at Brasher Park on Feb. 5 and Hillsborough County at the Cockroach Bay Ramp on February 7. Though date have not been announced additional releases will happen in Charlotte, Collier, Lee, Manatee and Sarasota counties. Tarpon, frequently referred to by anglers as “silver kings,” are a prized game fish of saltwater anglers along the Gulf Coast. In the early 1900s, future presidents flocked to coastal cities across the Gulf for a chance to catch one of these magnificent fish. However, as tarpon populations in the northern Gulf of Mexico began to decline in the 1960s, so did the number of tarpon fishermen. 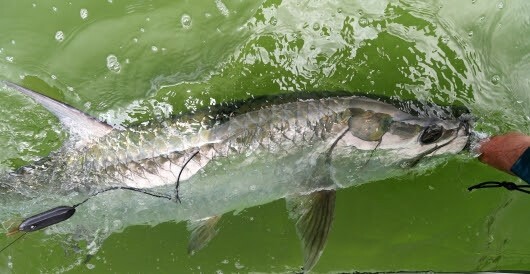 Tarpon declines are thought to result from a combination of fishing pressure and coastal development altering rivers and estuaries where juvenile tarpon reside until adulthood. Today’s tarpon fishery is primarily catch and release, with few tarpon kept as trophies. Although tarpon are not consumed in the United States, they are harvested in many Latin and South American countries for their meat and roe, and are considered a delicacy in some African countries, where it is served during special occasions such as marriage ceremonies and festivals. Tarpon are an ancient fish, and aspects of their biology further contribute to their vulnerability. They are slow growing and can live for over 80 years. During this time, tarpon can grow to over 8 feet long and well over 200 pounds. Tarpon are one of the most fecund fish species; once mature (about 10 years old), an individual female is capable of producing over 20 million eggs per year! Tarpon have been relatively well studied in other parts of the Gulf of Mexico (Florida, for example), but we know less about the tarpon we see off our coast. Given the cultural significance of tarpon, we sought to better understand their movements, migrations and habitat use in Mississippi and Alabama. In July 2018, we deployed satellite tags on 10 tarpon as they moved westward on their annual migration. Over the past month, the tags have transmitted over 5,000 messages, and have generated nearly 1000 position estimates (note not all messages provide successful position estimates). In general, these tarpon are moving west, often stopping at the Chandeleur Islands; however, a few have ventured offshore before returning inshore and resuming their westward migration. The Chesapeake Bay’s overall “dead zone” turned out to be average in size this year, but abnormal weather through spring and summer made for some extreme conditions along the way, according to reports from Maryland and Virginia. Researchers with the Virginia Institute of Marine Science determined via a computer model that the total volume of “hypoxic” water in the Bay, with oxygen levels low enough to stress fish, crabs and shellfish, was on par this year with that of 2017, taking up about 7 percent of the mainstem Chesapeake. The Maryland Department of Natural Resources, using water-quality data gathered in sampling cruises from June through September, reported similar findings for the Maryland portion of the Bay. The DNR said that 17 percent of its waters had low dissolved oxygen levels — which matched the long-term average from 1985 through 2017. But the DNR also found that abnormally wet weather through the first nine months of this year caused the low-oxygen zone in Maryland to gyrate in size from above-average in spring to near-record size by late June. It then plummeted to a record low in late July as a result of strong winds, followed by a rebound to higher than average in August and near-record again by late September. "It’s fascinating how the hypoxic volume was so low in late July and so high in early September, but overall the hypoxic volume was basically the same as last year," said Mary Friedrichs, a VIMS research associate professor who co-developed the dead zone model. Originally developed using federal funding, the 3-D, real-time model draws on 30 years of water-quality data collected by the Chesapeake Bay Program. Daily wind and river-flow information is also part of the calculation. Scientists had predicted the dead or hypoxic zone would be higher than average this year, based on high spring flows from the Susquehanna. The river, which normally furnishes half of the Chesapeake’s freshwater, was expected to pump unusually large amounts of nutrients into the Bay. Those nutrients — nitrogen and phosphorus — feed algae blooms, which die and decay, consuming oxygen in the deeper waters in the process. The dead zone grows in warm weather, which encourages algae growth, and the general lack of wind during summer usually prevents much mixing of relatively oxygen-rich surface waters with the oxygen-poor depths. Maryland experienced double the normal amount of rainfall in May, which the DNR said likely brought additional nutrients and sediment into the Bay and accounted for the larger than average dead zone in June. July also brought massive rainstorms in the Maryland and Pennsylvania portions of the Chesapeake watershed, resulting in near-record freshwater flows. But the high flows were accompanied by sustained winds of 20 knots that mixed oxygen into the Bay’s depths, just before the late July sampling cruise found a record-low size dead zone. Winds abated and river flows eased up in August, and the volume of low-oxygen water grew again and exceeded the long-term average by late in the month. By mid-September, the zone had reached near-record size, the DNR reported. The DNR said the fluctuation shows how weather can influence short-term conditions. Long term, it added, the dead zone has been shrinking, which a 2011 study attributed at least partly to pollution reduction efforts. High river flows pumping extra nutrients into the Bay, as they did this year, can buck that trend, the department noted. While the VIMS model indicates that the Baywide total amount of low-oxygen water for 2018 was similar to last year, Friedrichs said the seasonal patterns were clearly different this year. Low-oxygen waters averaged about 7 percent of the Bay’s entire volume during summer, with hypoxia more pronounced in Maryland, affecting nearly a fifth of its waters. This year, though, the dead zone occupied 14.4 percent of the Bay’s mainstem waters on July 5, Friedrichs said, but by July 26 — just three weeks later — had fallen to 0.14 the of mainstem water. Friedrichs noted that low-oxygen conditions generally started earlier and lasted longer than in recent years. Other research suggests climate change could make such early onsets of the dead zone more common, she said. Site 1: (furthest downstream site): Eelgrass was observed in four of the five GrowSAV Herbivory Exclusion Devices The protective coverings were not removed during the initial inspection, but most likely has grazed upon grass inside as well. Site 2 & 3: Eight of the ten planting sites had very dense Eelgrass! The grass is expanding outside of the GrowSAV Herbivory Exclusion Devices and flowering inside. A total of two flowers appeared to have been germinated and are producing seeds. It is believe that this is the first time in the 21st century where there has been seed pods growing in the lower river! Site 4: The one planting site (of five total) where the GrowSAV Herbivory Exclusion Devices was secured to the bottom had eelgrass growing. The other four sites were compromised by grazers. Site 5 (furthest upstream site): Sparse eelgrass was present, though this area appears to be negatively impacted by water depth and grazing from Blue Crabs. "Making progress in restoring the seed source for the lost seagrass beds in the tidal Caloosahatchee is a tremendous achievement. Seagrasses are the base of our aquatic food chain, supporting everything from crabs to endangered manatees. Continuing this project to learn how and where we can replenish them will have a significant impact in improving our ability to restore water quality and the ecology in the area." said Jennifer Hecker, Executive Director of the Charlotte Harbor National Estuary Program. In a 99-1 vote, senators acted overwhelmingly in support of water resources and sent landmark legislation to the president’s desk that would expedite restoration efforts in the Everglades. The “America’s Water Infrastructure Act of 2018” (S. 3021) also takes important steps to advance nature-based infrastructure solutions—like restoring wetlands and dunes to reduce flood and storm damage—that are more cost-effective for the American taxpayer. The American Museum of Fly Fishing exhibit On Fly in the Salt: American Saltwater Fly Fishing from the Surf to the Flats, is going on the road. It travels to the National Sporting Library and Museum in Middleburg, VA (10/12/18-3/3/19), the Yale Peabody Museum of Natural History in New Haven, CT (5/6/19 – 10/13/19) and the Florida Keys History and Discovery Center in Islamorada, FL (11/10/19 – 2/29/20). CB’s Saltwater Outfitters, 1249 Stickney Point Rd, Sarasota, FL has announced dates for their Orvis-Endorsed fly fishing schools for the upcoming fall through spring timeframe; Nov 17, 2018 and Jan 19, Feb. 23, Mar. 16, and Apr 13, 2019. Located on Siesta Key, named Best Beach in America, the schools will cover fly casting basics, line control, shooting line and the roll cast. Instructors, Capt. Rick Grassett and Capt. Ed Hurst, will also cover leader construction, fly selection and saltwater fly fishing techniques. The course, designed for beginning and intermediate fly casters, will focus on basics but also work with intermediate casters on correcting faults and improving casting skills. Cost for the schools, which will run from 8:30 AM to 2 PM, is $195 per person and includes the use of Orvis fly tackle and lunch. Contact CB’s Saltwater Outfitters at (941) 349-4400 or info@cbsoutfitters.com to make reservations. In collaboration with Bahamas National Trust and the local community in the East End. 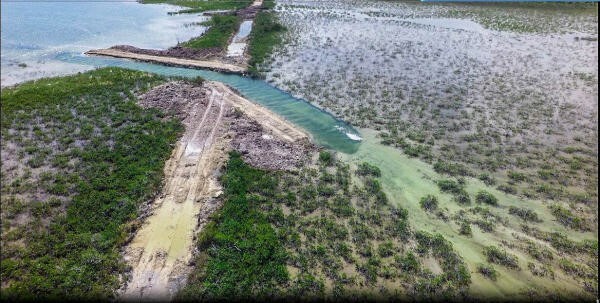 Grand Bahama Island, The Bonefish and Tarpon Trust has begun restoration of August Creek, blocked by a logging road since the 1950s. This restoration project is the first BTT has undertaken as part of its Bahamas Initiative, a nationwide collaborative effort to conserve the flats fishery. BTT designed a plan to reopen the creek and hired a local contractor to cut three strategic passes through the road. Almost immediately after the passes were completed, several species of fish, including bonefish, began utilizing the newly available habitat.